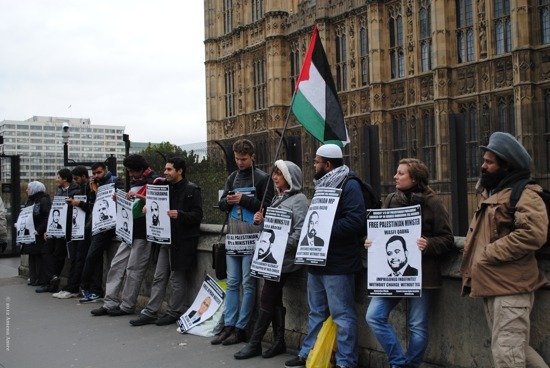 On Sunday 28th October 2012, 40 human rights activists protested outside Parliament demanding that the British government puts pressure on their Israeli counterparts to release all Palestinian MPs and other prisoners who have been illegally held in Israeli detention. After the 2006 elections, Israel has continued to arrest and imprison Palestinian parliamentarians. One such account is that of the arrest of Palestinian MP Ahmad Abdul-Aziz from his home in Ramallah on 15 July 2012. Without any charge against Ahmad, Israeli police ransacked his home and blindfolded him before taking him to an Israeli dungeon. This is in fact the second time he has been kidnapped, the first time being in 2006 when they imprisoned him for four years. Numerous cases of torture have been documented by Human Rights groups, which have taken place both during interrogation and outside interrogation. A father of four, MP Mohammad Al-Natsheh, was beaten up by prison guards on his way to the court. Activists held placards and distributed the most up-to-date flyers detailing the arrests of Palestinian MPs and Ministers. IHRC also urged all its supporters to write to their local MPs urging them to pressure their Israeli counterparts into releasing all political prisoners, and provided a sample letter on their action alert page for guidance.